What I think of most Western couples, their six year wedding anniversary is a celebration (as is every anniversary). By now, they have completed schooling, bought a house, own a car or two, and probably have a kid, or two, or three. They have a stable job, are cemented in hobbies, commitments, and passions. Today is our six year anniversary, and we indeed have reason to celebrate. In six years we have “checked all the boxes” mentioned above. We bought a house after being married one year, and sold it after five. We have purchased six vehicles in our marriage (three in the past year). Matthew has twice graduated with Bachelor degrees since this date. Matthew is on his second career. We have two kids (have ya noticed?). We have had many hobbies, committed and over-committed, and have been passionate about a few things. But, this year is our first wedding anniversary celebrated outside of Alaska. We still celebrated by doing the typical things: going out to eat and I got flowers…and we even finished a movie we had started the night before! We walked to a restaurant in our neighborhood that’s famous for its chicken. (Yay for having teenagers around to child sit!) On the way home, we walked through the open market in our neighborhood. Before you get to thinking it’s this magical, beautiful foreign market, just know that it’s only a few tables, with people selling all sorts of fruits, veggies, and a few necessities. A couple of money changers and guys selling phone cards and cigarettes make up the parameter. It’s all under trees, surrounded by a triangle intersection. The corner of this island in the road is a shipping container (or sea can, if you’re Canadian) that is the police station. It has a desk in it. Adjoining it is a place that sells plants. They’re planted in bags of dirt. We found two with pretty flowers blooming and we stopped long enough for the lady selling them to notice and give us a hard bargain. We walked away $5-ish poorer (or 4000 Congolese Francs), but we had fun. It was also fun to see the large group of men, shouting at a tiny TV with rabbit ears playing football (soccer for you Americans) in the middle of the market. It is amazing to see where the Lord has led us in our short marriage. At our wedding we sang a very beautiful (and very complicated) song called St. Patrick’s Breastplate. It’s lyrics are often attributed to St. Patrick. The first line is “I bind unto myself today, the strong name of the Trinity.” On our wedding day, we not only committed to each other, but renewed our commitment to serve the Lord, to obey Him in everything. We also sang “Be Thou My Vision,” again reminding us and those who were witness to the ceremony, that we were not just living for each other. We never imagined the Lord would take us all the way the Africa. 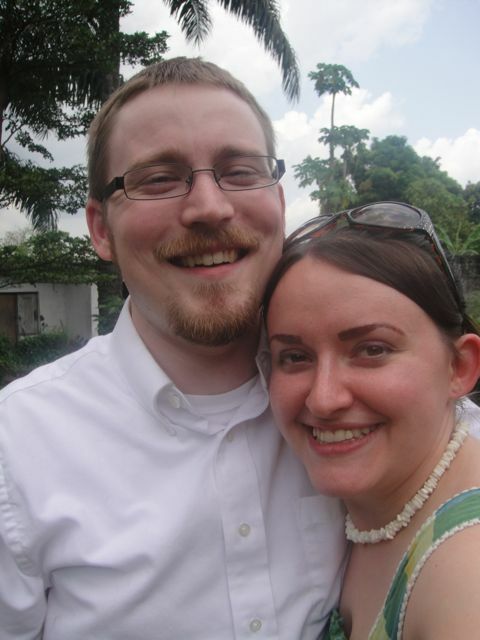 We never thought of ourselves as missionaries (still don’t, probably), and yet here we are, serving Him, just as we promised to do, together, six years ago today. So, in all of life, complicated and easy, fun and hard, in sickness and health, for better or worse, for richer or poorer…we are grateful for six years. We are grateful for all of you who are reading this, thinking of us, encouraging us, praying for us, and supporting us…family, friends, and strangers alike. We will continue to draw on the Lord for our strength, in both our marriage and our lives. And we look forward to many many more years of wedded bliss and service to our Savior. 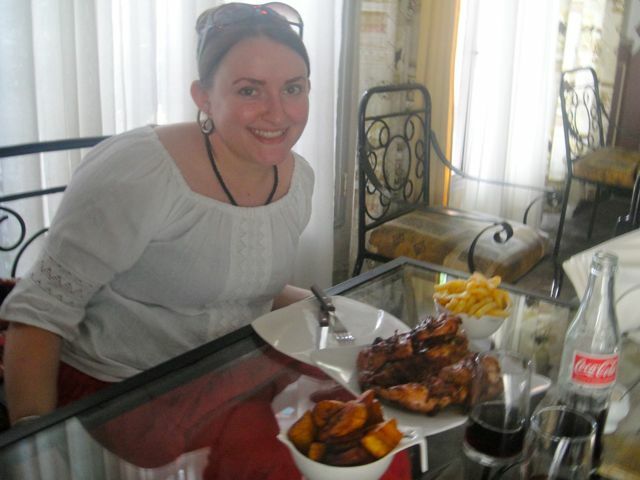 For today, we will celebrate with poulet and Coka…we had to order in French, of course. Happy anniversary! Lisa, you should write books! Such a beautiful account of your day!